Nike Air Jordan Retro 3 “Green Glow” Golf. 100% Authentic. ITEM: 2007 AIR JORDAN 3 RETRO FIRE RED. Jorran 3 Golf Prm AO8952200 Size 12. Condition is New with box. Shipped with USPS Priority Mail. DS, New in box. -Never Worn/Tried on. 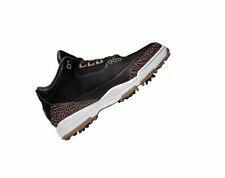 100% AUTHENTIC NEW 2018 JORDAN 3 PREMIUM GOLF SHOES - BROWN. OFFICIAL RELEASE DATE FEBRUARY 16, 2018. Up for auction is a brand new pair of retro Jordan 3 golf shoes size 13. Brand New 100% authentic. No reserve. Extremely hard to find! Men's Nike Air Jordan Retro 3 Golf Black Green Glow AJ3783-001 Size 10.5 DS NEW. Condition is New with box. Shipped with USPS Priority Mail. Brand new with box(box lid is missing). 100% authentic Jordan product. Ships immediately once payment is received via USPS Priority Mail (1-3 business days). Fast and Free Shipping with Guaranteed Delivery!! International Shipping available! A Pair Of Nike Jordan 3Lab5 Black DS shoes. Nike Air Jordan Retro 3 Premium Golf "Bronze"Item# AO8952-200. 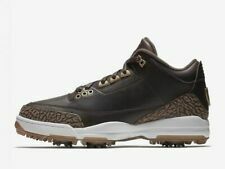 Nike Air Jordan Retro 3 Golf Shoe Brown Premium AO8952-200 Size 10.5 IN HAND!